The Eucharist is the most eminent sacrament, in which Christ himself is contained, offered and received. As children reach 2nd grade or above, we extend them an invitation to celebrate the sacrament of Eucharist. The Eucharist (“thanksgiving”) is the sacramental celebration of the Paschal Mystery (i.e., Christ’s dying and rising for humankind) in a context of praise and thanks for all that God has done and continues to do. The Eucharist is the most eminent sacrament, in which Christ himself is contained, offered and received. 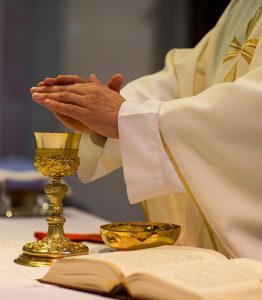 Besides receiving it at each Mass, on some occasions, Mass is replaced by a Communion Service. As children reach 2nd grade or above, we extend them an invitation to celebrate the sacrament of the Eucharist through participation in our Regional School or Parish School of Religion Program. We also have an Adoration Chapel on the west side of the church where we have the Blessed Sacrament exposed almost 24/7. There are some times when it is not especially on weekends during Mass and certain holidays etc.